In January 2019, the promoter team of Fairbnb met in Bologna for an intense week of work. Over the weekend, they locked up in a rural house in Valsamoggia (Bologna) for a retreat that gave very interesting results. This work retreat was suggested by part of the team as an opportunity to work on building trust inside the team. A team that wants to work as a teal organization, under distributed leadership schemes and without a traditional hierarchy model needs, first of all, to build a strong feeling of trust among the members of the group. Working for a weekend is not enough to change our organizational culture to a more collaborative one, but was very important to start working some concepts, experimenting several internal dynamics and adopt some first social and collaborative tools and methods. This is a work that we will need to do every day, in every interaction we have inside the team and the whole network. Little by little we will be able to embrace all the complexity of a distributed leadership and collaborative organization and the different tools and methods needed. Great 1st day of #Fairbnb team meeting in the house of one of our first hosts near #Bologna. Thanks to Casamaiola for the hospitality in a great location. Warm crackling fire and good ideas, the future is bright and fair. Each of us expressed his/her vision of the purpose around Fairbnb. We had one round to express it using drawing/collage tools and writing down at least 3 main ideas / aspects that were key in our vision. After it we made a rotation and had to “complete” the work of one of our colleagues being very constructive. From a very wide vision we could see how we have different visions that, however, we all agree in general can cohabitate in an harmonious way. They are very present in the project itself and how we tell it. On one side we have the more “activist” , advocacy or community side of the project. Some members of the team stressed a lot this part of Fairbnb as a tool for social change capable to transform the way we inhabit our territories, a tool to give it back the sovereignty to the neighbours. On the other side we have a vision that is more focused on making business, creating a market associated to a strong product that delivers good results. As a general vision several members of the team wanted to stress the importance of having always very clear the relation among the global dimension and the specificity of every territory and its local community. Is easy to lose this vision inside of a global project with global dynamics that can affect the needs of small hyperlocal contexts. Fairbnb is then a multilayered reality with a common purpose. We must be capable to harmonize the different approaches, for that we will need different approaches and procedures. During the whole weekend we worked on the three topics throughout different activities and dynamics. After a whole weekend exploring inside ourselves, identifying and making visible our concerns, the dysfunctions and potentials of the team we focused this part of the weekend on creating a specific list of tasks and promoting a distributed leadership model that would help creating a more proactive, autonomous and trustful environment of work. The retreat ended having lunch together with different personalities from the City Council of Valsamoggia. This first retreat has been hosted by Casa Maiola, an artist’s residence not far from Bologna that will soon become part of the FairBNB offer for internal or metropolitan areas. Would you like to work with us to make Fairbnb grow faster? the more “activist” , advocacy or community side of the project. 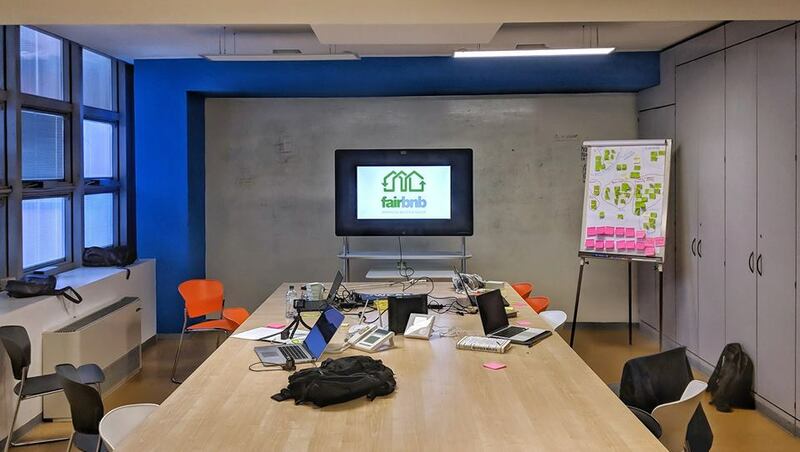 Some members of the team stressed a lot this part of Fairbnb as a tool for social change capable to transform the way we inhabit our territories, a tool to give it back the sovereignty to the neighbours.